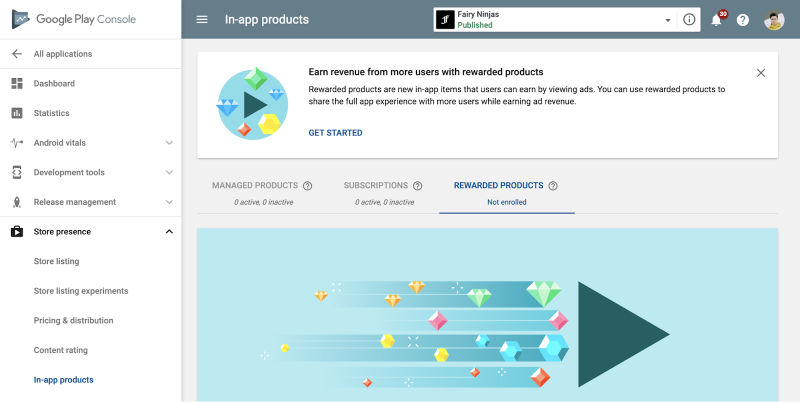 Google has recently introduced a new feature called ‘Rewarded Products’ to allow app developers monetize free users. According to one study, 94.24% of app downloads are free, and its no surprise that free apps will always be more popular than premium apps, and this move from Google will greatly help app developers who offer non-paid apps. As users generally would prefer using a free app than purchase a premium app, developers now prefer to release games and apps that offer In-app purchases to be able to monetize from their free apps. But still, most users are not willing to shell out cash for in-app purchases. And one way developers monetize them is by giving out rewards for watching advertisements. This practice has been around for a long time, but it required implementing extra SDKs and Google is only now making this method as an official platform feature. According to the company, Rewarded Products “significantly reduces the work required to implement”. These adverts served from AdMob, and the app developer will then earn ad revenue from the user watching the video. The feature is currently in open beta in the Play Console and you can get started with “Rewarded Products” here.